Have you ever owned a piece of clothing that you wore far more often than you ever thought you would? Back when I used to design for Ralph Lauren we had all sort of perks, and my favorite was the amazing sample sales. At one of those sample sales I found a black fleece moto jacket that I’ve been wearing ever since. It’s cozy and warm and surprisingly versatile. In fact, the versatility of that jacket has impressed me over and over again. At one time I might have thought that a moto jacket was strictly for a more dangerous person than myself. But I’ve found that the moto jacket can go almost anywhere! I wear it to meetings, to evening events, and of course on weekends. 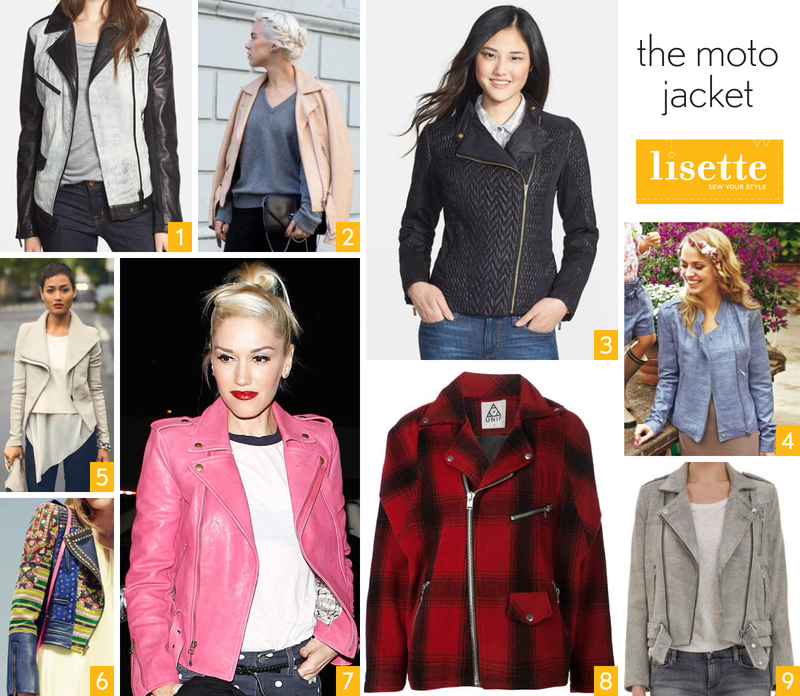 I mentioned this versatility the other day when I introduced the new Lisette patterns, but I thought it might be helpful for you to see the moto jacket in action, in its natural habitat. So I’ve been collecting photos for you! I shared one idea with you last week: wouldn’t it be great to embellish the jacket with tonal embroidery like this? But there are so many other ways to make and wear this style! I love the use of multiple colors and textures/fabrics here. Textured color blocking like this gives an illusion of a layered vest, which sort of breaks up the full moto jacket if it feels a little too much to you. And if you’ve wanted to sew leather but don’t want to go all leather, this is a great (and more affordable) option. The pale pink color of this jacket really gives it a nice feminine touch. The quilted front panel gives this jacket a great texture. Cream is so soft and pretty, especially layered with other light neutrals. Love the sheer layer peeking out underneath! Or go all-in boho and embrace the patchwork idea! This would work really well with scraps of home-dec weight fabrics. Hot pink moto jacket? Again, great combination of pretty and edgy here. For cool weather, try a buffalo plaid version! What about a light taupe suede version? This would be great for spring. Try wool crepe for a lightweight, drapey, flattering version of the jacket that would be great for work, too. 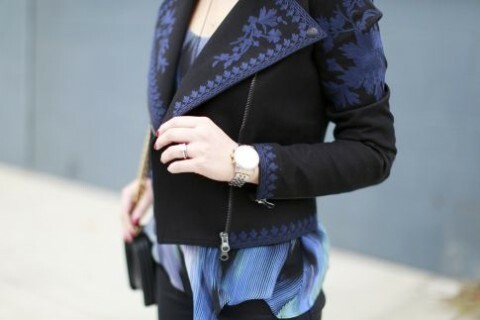 Try sewing the jacket in a stable knit fabric for a cozy take on this style. There’s something really refreshing about a soft tonal palette like this outfit, which is all about the texture. The gray denim, textured jersey and monochromatic jacket look great together. The colors in this oversized tartan plaid are subtle enough that the jacket could still be worn as a basic and be an extremely versatile piece. Dress up the moto jacket and it will be perfect for a corporate job if you sew it with wool flannel or crepe like this one. I love the contrast-color facing on the facings. This is an interesting color-blocking alternative. Pale pink with dark zippers give this feminine style a bit of an edge. And that’s just the start! I saved some of my favorite images for my Lisette Pinterest board. Take a look for lots more ideas and for larger, un-cropped views of the photos above. I can’t wait to sew this for my teenage girls. We have a piece of winter white wool waiting to go. 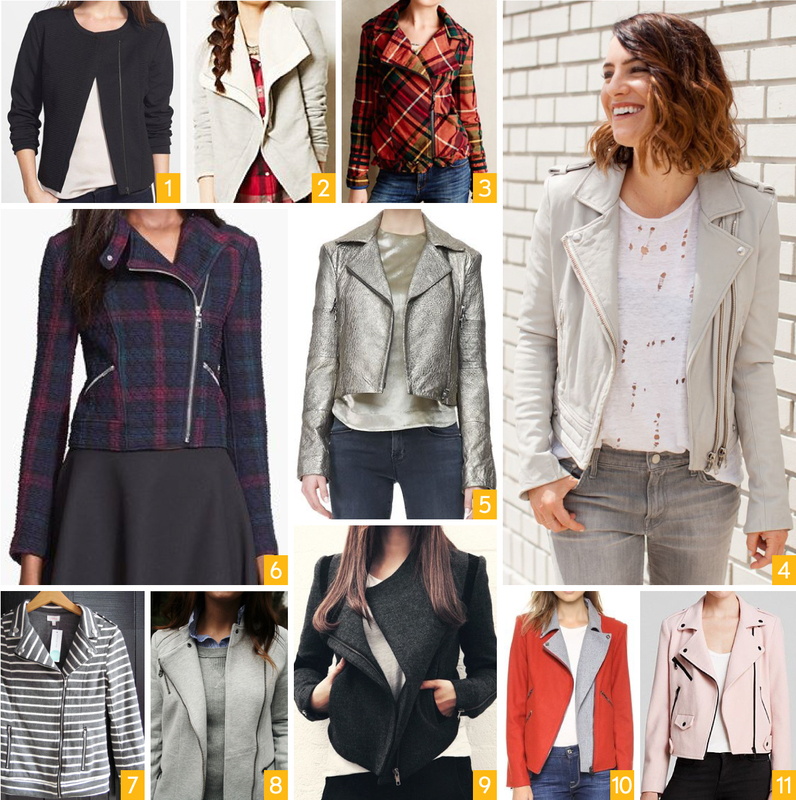 I just recieved Butterick 6169 and would love to follow along in a sew along of the moto jacket!